This is not a camellia though the flower looks very similar to a large, pure white single camellia with showy golden stamens. They are botanically related from a distance, as stewartias are too. Gordonias are sometimes known as the fried egg plant because the flowers drop off whole and land sunny side up where they resemble, loosely speaking, that breakfast food. This form is yunnanensis which simply means it is from the Yunnan province in southern China. As far as I know, it is the largest flowered form. There are other forms around – axillaris is the most common but yunnanensis has much better flowers and plenty of them which open from now through winter. It also has a lovely glaucous, or blue-grey, tone to the shiny leaves. We also have an unidentified Vietnamese species which has slightly smaller flowers, bright green foliage and a more compact habit than yunnanensis though we are still talking around four metres high. Gordonias are evergreen with shiny foliage and reasonable wind resistance. Most of them come from eastern parts of Asia (there are a few which come from mild areas of North America) and will make large shrubs or small trees. While we have seen the odd pink tinged one, basically they are all white with petals that look a little like crushed tissue paper. They could, perhaps, be described as the very large pure white camellia you have when you are not having a camellia. 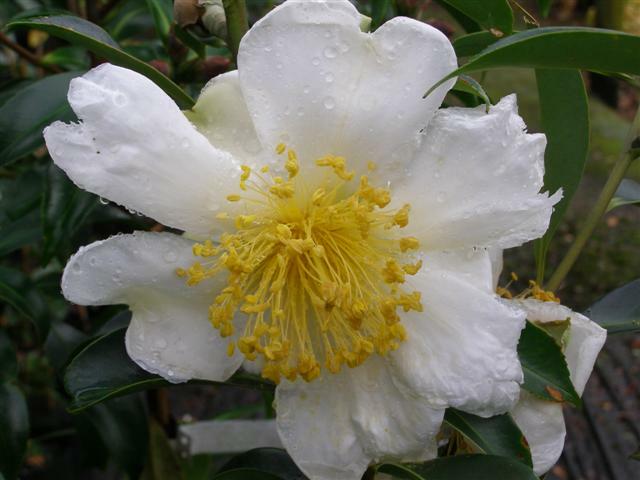 This entry was posted in Plant collector and tagged Abbie Jury, Gordonia, Gordonia yunnanensis on 30 April 2010 by Abbie Jury.